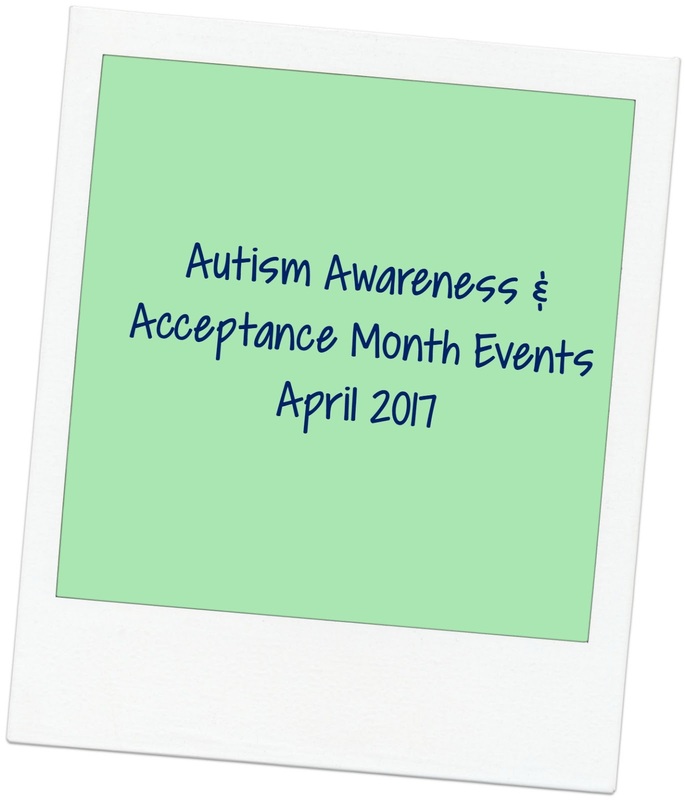 As always, April is a great month to learn more about autism and to find fun activities for people on the spectrum. Here are several things going on around Chapel Hill this month - please share! A participatory music workshop for people with developmental disabilities and their families. Afterward, stay and jam! Instruments will be available for everyone to play. Sponsored by the Adapted Recreation and Inclusion program of Chapel Hill Parks & Rec. For more information, contact Marian Kaslovsky at 919-968-2813 or mkaslovsky@townofchapelhill.org. No registration necessary - just stop by! How to Dance in Ohio is a documentary that profiles three young women with autism preparing to attend a formal dance. The movie "reevaluates the definition of normal by emphasizing the universal need to belong, connect and grow, and by celebrating every individual's unique path". A discussion and reception will follow the screening. 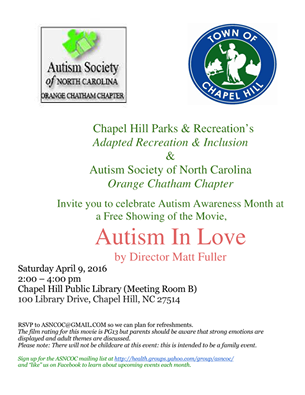 Co-sponsored by the Autism Society of NC Orange-Chatham Chapter and the Adapted Recreation and Inclusion program of Chapel Hill Parks & Rec. Open to anyone with an interest in learning more about youth and autism. Please R.s.v.p. to asncoc@gmail.com to indicate how many people are attending. A special playtime open to children ages 8 or under with any kind of disability/special need. Designed so families can enjoy the hands-on exhibit spaces without the extra stimulation found during the museum's busy open hours. Co-sponsored by the Adapted Recreation and Inclusion program of Chapel Hill Parks & Rec, the Autism Society of NC Orange-Chatham Chapter and Kidzu. Spaces are limited, so please register soon at: www.townofchapelhill.org/register. Click on Adapted Rec. & look for activity #230630A Siblings are welcome too, but must also be registered. We appreciate all of the area therapists and other providers who reach out to us to share their services with the local autism community. Please take a moment to check out our newest additions to the Therapists page: Psychologist Jon Ross in Carrboro and Greenleaf Psychological & Support Services in Durham. We are also delighted to welcome the drama therapy program Acting is Awesome! to the Recreation page. Drama therapist Amy Elliot, Ph.D. LPC RDT of "Acting is Awesome!" Please visit our Therapists Page for more information about Stafford Behavioral Consulting. 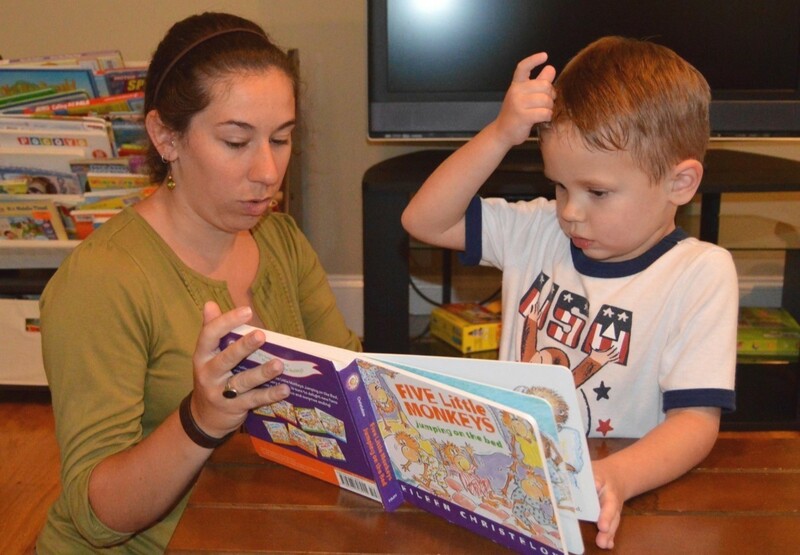 Are you an autism therapist in Chapel Hill, Durham, or Raleigh (or a parent who knows of excellent local therapists?) - feel free to contact us to request inclusion in our list. Thank you! Image via Stafford Behavioral Consulting, PLLC. Although we can't keep up with the blog as often as we would like, we do share as many resources as possible on the CHART Facebook page on an ongoing basis. Recently we've shared information about quite a few upcoming social skills groups for summer 2016 - not only for boys, but even a new group for girls with autism and other social-communication challenges. So be sure to "like" our page, check the box to see our posts in your news feed, and turn on notifications so you don't miss a thing (Facebook has a lot of hoops to jump through in order to see posts from your favorite pages!). 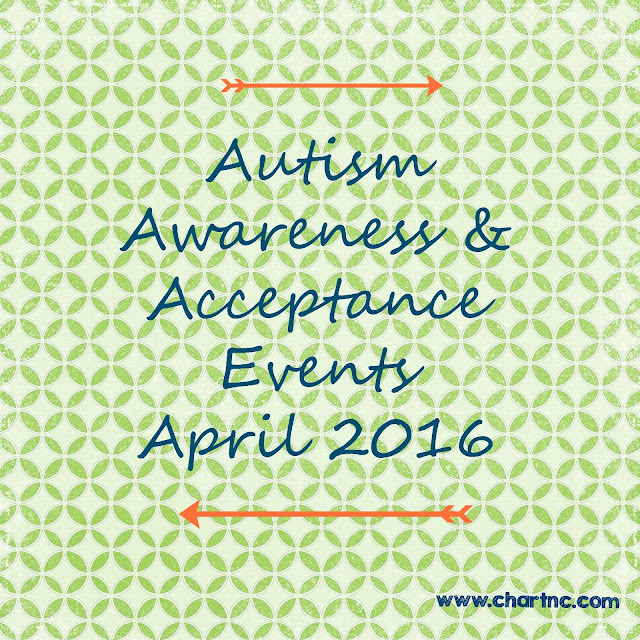 No doubt you already know that April has been designated Autism Awareness + Acceptance Month. 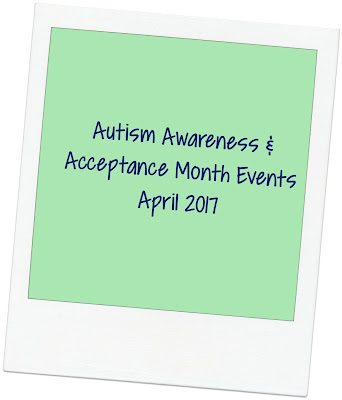 But did you know that there are a huge number of autism-related events going on around the Triangle in April? The list of offerings seems to grow every year, so these are just some of them. Be sure to follow CHART on Facebook to hear about more April autism events as we learn about them! Chapel Hill photographer Mary Berridge shares her portraits of individuals on the autism spectrum. 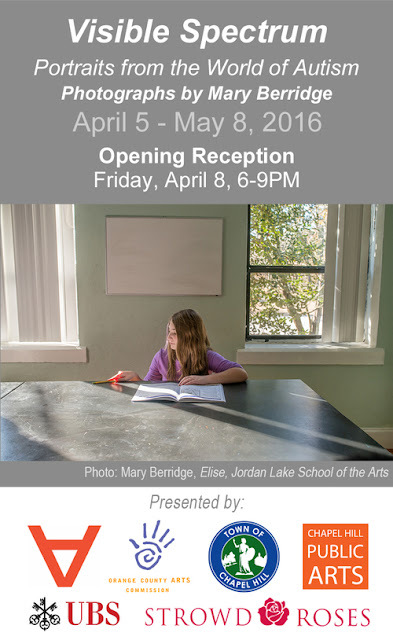 Photography exhibit runs from April 5th - May 8th. Where: FRANK Gallery, 109 E. Franklin Street, Chapel Hill, NC 27514. Presented in the Community Outreach Gallery. Please R.s.v.p. to ASNCOC@GMAIL.COM so they can plan for refreshments. The film rating for this movie is PG13 but parents should be aware that strong emotions are displayed and adult themes are discussed. Please note: There will not be childcare at this event, as it is intended to be a family event. Shop for a great cause! A LuLaRoe Pop-Up Boutique will be held to benefit the Autism Society of North Carolina. 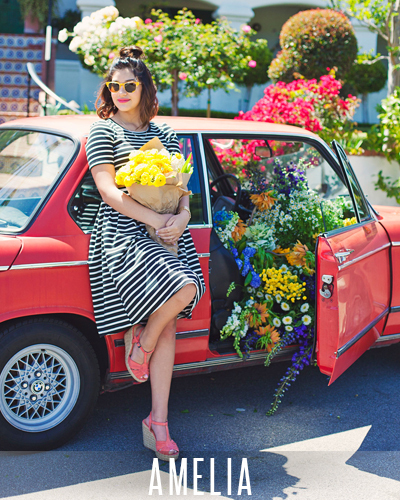 LuLaRoe is a fashion brand that sells cute and comfortable women's and girls' leggings, dresses, maxi skirts, pencil skirts, and A-line skirts. Sponsored by the Autism Society of North Carolina Durham, Orange-Chatham, and Wake County Chapters. Dine 4 Autism is both a fundraising and an autism awareness event. More than 40 restaurants, Triangle-wide, will be donating a portion of their sales — breakfast, lunch and dinner — to support local individuals on the autism spectrum and their families. Eat at a participating restaurant on this date and restaurants will donate 10% to the Triangle ASNC chapters. Join the event on Facebook and invite your friends! Know of another Autism Awareness Month event this April? Feel fee to share it on our Facebook page and tag us so we can spread the word (please note that reaching out on Facebook is a faster way to have your event shared than emailing us the flyer). Thanks! Please join us in welcoming the newest additions to the resources on CHART. 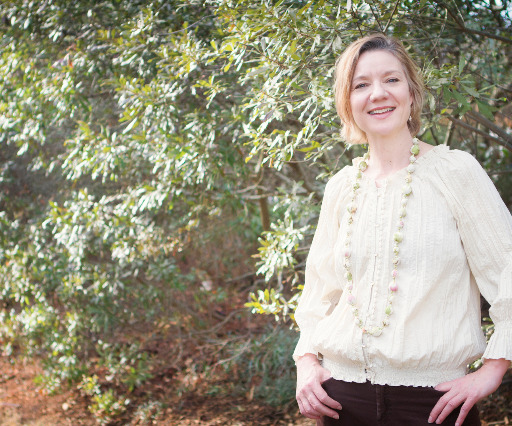 Dr. Caroline Hexdall of the Center for Mindful Development, PLCC can now be found on our Therapists page. She offers a comprehensive range of psychological services for children and adolescents and their families, with a specialization in supporting individuals with developmental disabilities. Of particular note are her support groups in Hillsborough for parents of children with disabilities and mindful parenting classes. Image via Community Partnerships, Inc.
We are also pleased to welcome Community Partnerships, Inc. to our Organizations page. They offer a broad range of services to children and adults with intellectual and/or developmental disabilities, as well as to adults with mental health or substance abuse issues. The program that particularly caught our attention is their Partners in Inclusion service in Durham and Wake Counties, which helps children succeed in community settings. They provide individualized on-site guidance to staff of childcare centers, preschool, and recreation centers to ensure successful inclusion of the child with a disability. It sounds like an outstanding resource for families whose children struggle in summer camp, after care, or other community activities. As always, we welcome suggestions for other resources across the Triangle; please let us know! The Autism Society of North Carolina UNC-Chapel Hill Campus Chapter is sponsoring two great Valentine's events for children with autism! First is their Hearts and Crafts event - parents can drop off their kids with autism or developmental disabilities (free respite!!) for an afternoon of playing board games, making crafts, and making Valentine's Day crafts. Not only that, but the ASNC UNC-Chapel Hill Chapter is also sending Valentine's Day cards to children of all ages with autism or other developmental disabilities. Don't you just love that? To request a card for your loved one, please submit your request by February 4th at 5pm using this link: https://docs.google.com/forms/d/1tLlnxvHlgIlYfHOp33LbRl5KyMRaTjpOkzhPplRxlJ4/viewform. We hope that everyone has a wonderful Valentine's Day!